President Teddy Roosevelt was happy to get out of the White House and go hunting in the woods about 25 miles north of Vicksburg, Mississippi. He set out for the four-day hunt on a fine November day in 1902. Soon toy manufacturers were producing “Teddy’s Bears” in honor of the event. The stuffed toys were later called teddy bears. 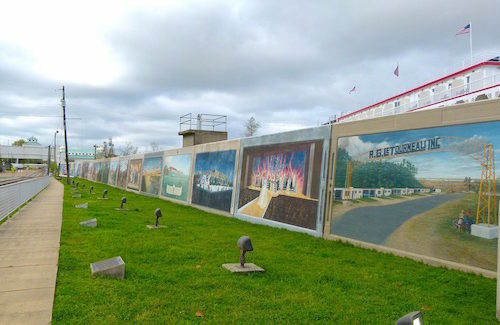 That fascinating bit of trivia is featured on Vicksburg’s Riverfront Murals, 32 murals painted on the city’s flood wall by renowned artist Robert Dafford. Each mural measures a huge 12-by-20 feet. When the American Duchess docked in Vicksburg, we could easily walk off the boat and visit the nearby flood wall. For my day in the city, however, I used the hop-on, hop-off Steamcoach to ride around downtown and then got off when the bus neared the flood wall. I had seen Robert Dafford’s work on other riverfront murals and think it is an excellent idea. The large concrete walls are a necessity for flood protection from the Mississippi River but having them painted with local history is a pleasure to see. The artist did similar murals in Portsmouth, Ohio; Cincinnati, Ohio; Maysville, Kentucky; and Paducah, Kentucky. It was in Paducah that Vicksburg resident Nellie Caldwell saw the Louisiana man’s work and chaired a committee to bring him to Vicksburg. For his projects, the artist meets with local officials and historians to create a list of subjects related to the town’s history. The walls are water-blasted and covered with a coating that fills up the surface and smooths it out. Then Robert Dafford designs and completes each mural. On April 12, 2002, the City of Vicksburg unveiled its first riverfront mural. The panels feature the city’s role in American history, commerce, culture, region and technology. One of my favorite murals honors blues legend Willie Dixon including his quote “The blues are the roots, the rest are the fruits.” Born in Vicksburg in 1915, Willie Dixon created a playlist of more than 500 songs performed by some of the most famous artist of the 20th century, including Muddy Waters, Sam Cooke, Etta James, the Rolling Stones, Elvis Presley and Eric Clapton. The mural shows Willie Dixon playing in the Blue Room, a famous Vicksburg lounge. The Blue Room opened in the 1940s and closed in 1972. Called “The Poet Laureate of the Blues,” Willie Dixon died in 1992 at age 76. The Sultana tragedy also is the subject of one mural. A side-wheel steamboat, the Sultana was built in 1863 and designed to carry 376 passengers. On April 24, 1865, however, the Sultana docked in Vicksburg to pick up Union soldiers recently released from Confederate prisons and was crammed with far more souls than it could carry. The Federal Government paid steamboat lines $5 per solder for the trip to Cairo, Illinois. Prior to arrival in Vicksburg, it was discovered that one of the boat’s four boilers was leaking. Instead of taking time to replace the boiler and perhaps lose the commission to ferry the men, workers put a metal patch over the damaged boiler. To make matters even worse, greedy boat owners loaded 2,300 soldiers on the Sultana. In the early morning hours of April 27, three of the four boilers exploded when the boat was seven miles north of Memphis. More than 1,700 people were killed in the explosion. Many were burned to death in the terrifying fire that followed. Others were drowned in the swift flood waters of the Mississippi. The accident is said to be the worst maritime disaster in American history.